The Car GuideTests and FeaturesFirst Drives2012 Nissan Versa Sedan: Shift expectations? 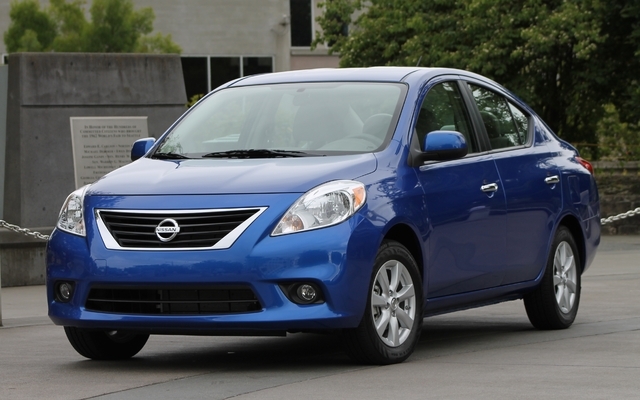 2012 Nissan Versa Sedan: Shift expectations? By putting too much emphasis on affordability, Nissan, creator of such exotic cars as the Cube and the Juke, forgot that a little flash makes all the difference. So here we are, already complaining about the car that, at $11,798, is THE least expensive car on the market. After all, price isn’t the most important thing about a sub-compact? Apparently not. You need a bit of flash and distinctiveness in a category that has been seriously refined over the course of the last year. Take, for example, the technological Ford Fiesta, the incisive Mazda2 and the oh-so-lovely Hyundai Accent, to name but three. Compared to these competitors, the new Versa sedan (the hatchback version will arrive later) is right in the middle of the pack in terms of ride and style: no better, no worse. However, when you compare it to the old Versa, there’s room for substantial improvement. How, you ask? Sure, it still has the same 1.6-litre four-cylinder engine, with its 109 hp and 107 lbs-ft of torque (two more horses, four lbs-ft less). But this engine – one of the least powerful around, by the way, features the first improvement: there are twice as many injectors and they are of the continuously variable variety. Indeed, the continuously variable transmission replaces the four-speed automatic transmission. Nissan knows its way around the CVT, especially with the current Versa hatchback equipped with a 1.8-litre engine and 122 horsepower. And we already know that without manual mode, this transmission can be temperamental. Surprise, surprise, the 2012 Versa sedan will be equipped with a second generation CVT. More compact and enhanced by a planetary gear system, this transmission has a more extensive gear ratio, and that does it a lot of good. Although its takeoff isn’t great, the accelerations are more flexible than before and the pick-up is less restrained and less noisy. In fact, the engine revolutions are now in tune with what’s really happening on board and 109 hp here are worth 120 elsewhere, especially since 68 kg of weight were trimmed from the car overall. As for fuel consumption, Nissan is reporting one litre less (15%) city/highway combined compared to the automatic they’re retiring. If that turns out to be true, it’s huge. There’s still a five-speed manual transmission, but we weren’t able to test drive it. And you definitely won’t want to, either, for one simple reason: it promises to be 10% (!) less fuel efficient than the CVT. Other significant changes include the style, which takes one giant step into the present. The thin, anonymous front grille and the Saturn Ionesque lines are a thing of the past. It now features a wonderfully cheeky nose, muscular sides and teardrop rear windows creating a more elegant side view. In other words, it’s a job well done from a visual standpoint, even though it lost 3 cm of rear headroom in the process. Hidden beneath all that is a brand new platform. Gone is the “B” that it shared with the Sentra, making way for a “V” that’s already in use on the Micro/March (still not available on our continent, unfortunately). As a result, the new Versa sedan is smaller, mainly in height and in the engine block, which helps make handling more solid. The car did in fact feel more rooted and less sensitive to crosswinds. The rear torsion bar suspension is well controlled. The ride is comfortable, even though the shocks absorbers are relatively busy. It still has power steering, which has also been tightened up for improved connection with the road. A short turning diameter (10.6 metres) and small size make it easy to negotiate the car in traffic and parking lots. As for the brakes (it still has rear drum brakes), while they tend to lack bite at first, they become progressively more powerful over the braking distance. Above all, the new Versa sedan remains spacious. The Versa has always been a compact car on other international markets, but the Nissan chose to introduce it here as a sub-compact. Thus, it should come as no surprise that the trunk remains one of the roomiest in the category. At 419 litres (up 7%), it surpasses even the 389 litres of the new Hyundai Accent. On the other hand, there are no great innovations in the passenger compartment. That means there’s no leather upholstery or heated seats, and you can forget about keyless drive (too bad!). This is a traditional interior at best. Some might even call it old-fashioned. Sure, the controls are easy to master and the seats, after a long half-day ride, still seemed very comfortable. But the overall look isn’t as contemporary as you’d expect for a new generation. It’s especially striking at the wheel – a central and key feature if there is one – whose design seems stuck in the 2000s. I really preferred the big steering wheel that Nissan used to use in its high end models. The soundproofing also seems very average. On the paved highways on the outskirts of Seattle, I had a hard time holding a conversation with the other passenger. The plastics used on board were noticeably hard, as well. But since we tested a pre-production car, we’ll save our final judgment for when the assembly lines (still in Mexico) start to roll at full steam. One thing is certain: despite a height-adjustable driver’s seat, which comes standard on all versions, I found myself constantly adjusting my driving position. Blame for this falls squarely on the non-telescopic steering wheel. Practically none of the Versa’s competitors offer telescopic steering, but it generally isn’t a problem. With the Versa, however, it is. Our advice? Choose the SV! Having the lowest price on the market (for now, at least) meant having to cut somewhere. Thus, the rear bench cannot be folded down anymore in the base version (S), which comes with a manual gearbox and without air conditioning, a power package or remote locks. The real bargain, in our opinion, is the SV version, which comes with all of those things for less than $13,800 ($1,300 more for the CVT).